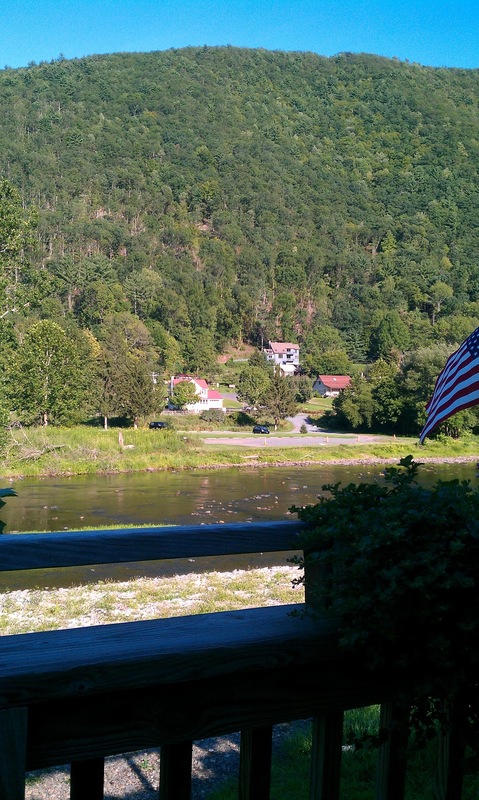 We went on vacation last week, stayed in a rental place north of Lock Haven, deep in the fracking territory. Seriously, there were water trucks, dump trucks, cranes, and lots of white pickup trucks on the road all day and all night. Not really that bad, though: they'd obviously been well-indoctrinated into the idea that being rude on the road was not a good idea. They were mostly friendly, and the roads were in pretty good shape (there were some obvious problems -- potholes, grooves -- and they were all marked for repair). Anyway! 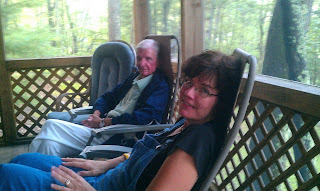 We went up Friday the 19th, got in, made dinner, and just listened to the insects and the rain. 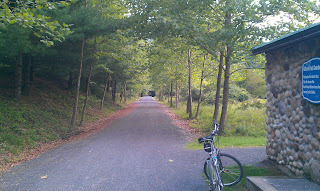 Next day we got up and headed over to the Pine Creek Rail Trail, parked at the Waterville Access. This required a 4 mile trip down a fairly rough and narrow dirt road, Lower Pine Bottom, an exhilarating ride we'd make several more times in the coming week (it was necessitated by bridge work on Rt. 44). We rode 22 miles on the trail, a beautiful day to ride. I fried up some delish pork chops for dinner, with tomato salad and roasted potatoes. We were drinking Sly Fox Pils and Sierra Nevada Torpedo, Bulleit Bourbon, and some New Zealand Sauvignon Blanc. Another peaceful night. Sunday we made the 10:30 mass at Annunciation Church in Williamsport -- a rollicking mass, we'd walked into a parish consolidation fight! -- and then met my friend Sam Komlenic and his wife Amy (and two friends Doc and Carlene) at Bullfrog for an excellent brunch. I had a couple beers and a delicious "breakfast bowl," everyone enjoyed the food and beer, a great time at table. Sam and Amy went back to the rental with us and stayed overnight. As dinner was cooking, Sam got out his box of whiskey, and I got out mine. My box was mostly for him -- stuff I had picked up for him elsewhere -- and a bottle of aged genever (8 year old genever is surprisingly whisky-like! ); his box was much cooler: antique Pennsylvania whiskeys. 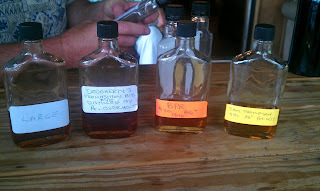 The one on the left, labeled simply "Large," is indeed Large whiskey, from the Large Distillery in Large, Pennsylvania, a true Monongahela Rye, and it had held up beautifully, a very nice whiskey indeed. It was quite an afternoon and evening; educational. Then Sam and our friend John Lelak and I got into a political discussion -- John's a Fox News Republican, Sam's a libertarian-leaning liberal Democrat (no, really), and I'm ornery -- and yelled and pounded on the table and had another drink and laughed at it all. Why, we thought, couldn't the Congress work like this? At one point, Sam was telling a story about fireworks and brought down the lights -- literally -- but we fixed that. It was a good night. Monday we all went down to State College -- that's the area where Sam and Amy live -- where we made a stop at Hogs Galore to buy pork products -- delicious sausage, Canadian bacon, and ham -- and then to the Creamery at Penn State, and finally dinner at Otto's. Another good day! Tuesday, we all drove up to Wellsboro, where John headed for home, Cathy and Nora (and Nora's friend Kate) had lunch and did some shopping...and Thomas and I mounted up and rode south on the Trail. We had a great day for it, and the Pennsylvania Grand Canyon was breath-takingly beautiful: blue skies, steep tree-covered hills, and the constant cool companionship of Pine Creek burbling alongside. We rode downstream about 34 miles, then took a break for dinner at the Hotel Manor in Slate Run. It was great: fresh Sam Adam Ofest and SNPA, great crab cakes, and some lightly fried calamari. Back on the bikes and on to the Waterville Access Area, where we loaded the bikes on the Fit (we'd left it there in the morning) and back up Lower Pine Bottom to the cabin: a 50.3 mile ride for the day! Wednesday was a pretty lazy day; we mostly hung around the cabin, read, did a little walking, cooked up some eggs and bacon for lunch. Cathy and I went into town for groceries and got caught up on email at a great coffee shop, Avenue 209. 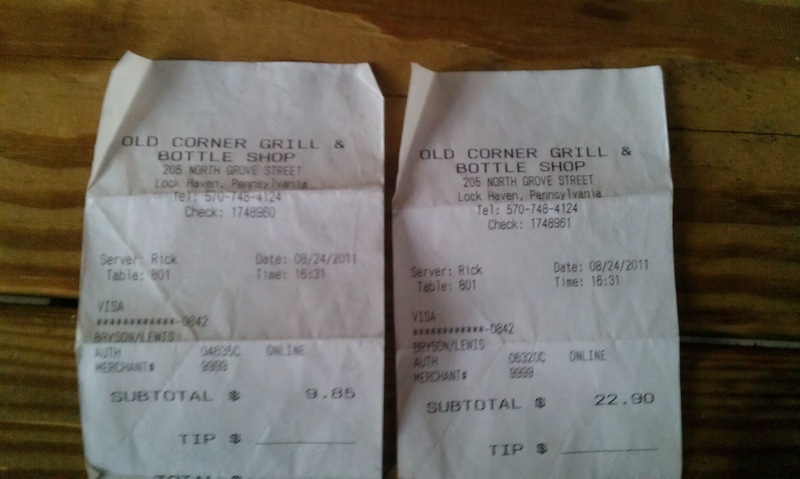 We also bought beer at the Old Corner, a nice little bar and bottleshop in Lock Haven. I got a 12-pack of Franziskaner and a sixer of Troegenator (my bro-in-law Curt was coming, and he doesn't like hops), and took them to the counter. "I'll have to ring these up separate," the guy says. 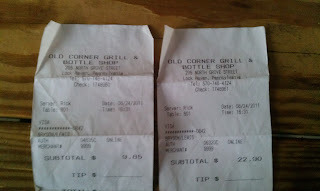 OMG, I'd forgotten PA's screwy beer takeout law: only 192 oz. maximum at a time! He had to ring them up separately (see the receipts? ), and I actually had to take the Franz out to the car and come back in to get the Troegenator in order to be legal. Can you believe it? And this law...accomplishes something? 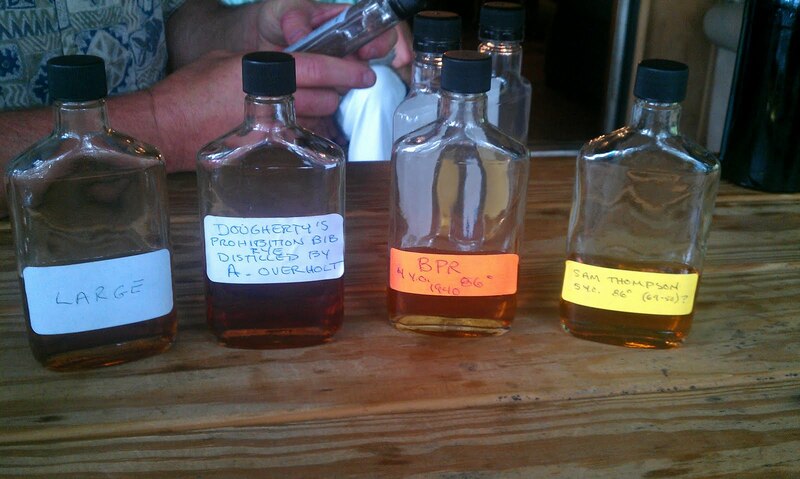 The PA Liquor Code needs an enema. We headed back up the mountain (it was about 1500 feet higher than in Lock Haven) and made dinner. Then about 7:30 that night, we heard a noise...I fumbled my phone out of my pocket and took the video you see here, of a black bear calmly walking up past our cars; looked to be about a 300 lb. bear. Pretty exciting; I've seen plenty of wildlife in PA, and there were wild turkey and deer all over, but that's the first time I've seen a bear up close. 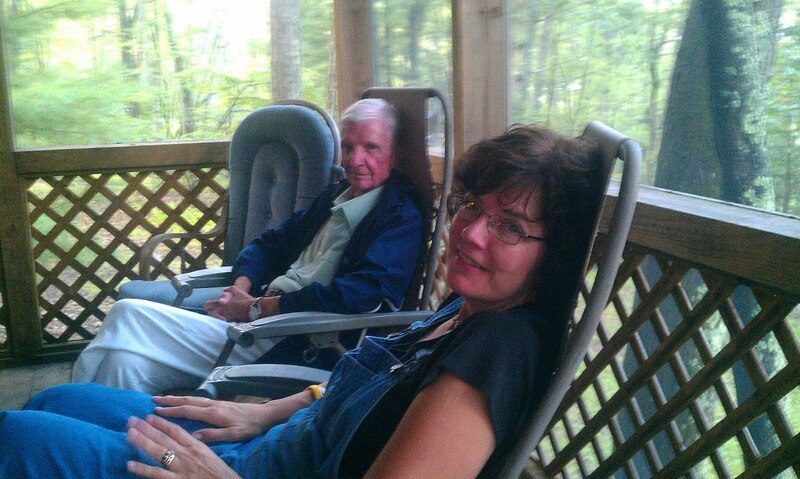 Wednesday night, late, Curt, his son Patrick, my niece Evelyn, and my mother-in-law showed up. We talked, had some beers, and hit the sack late. 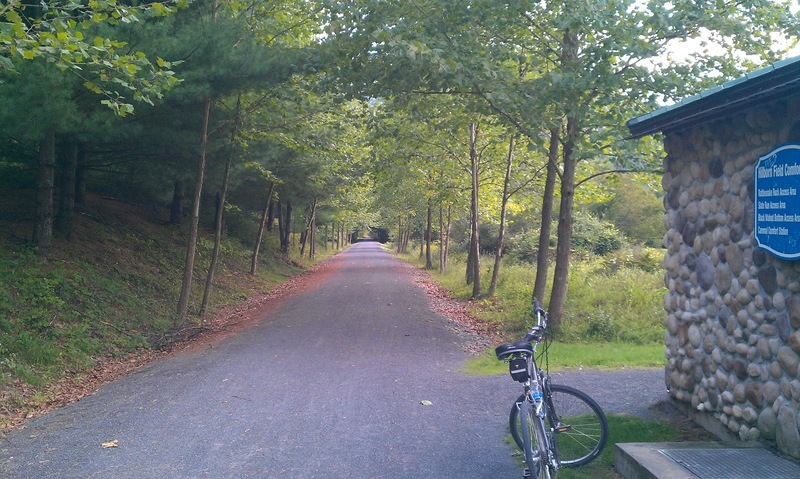 Thursday I took my bike into Lock Haven to The Bike Gallery to get a busted spoke fixed, dropped off laundry to be done, and went back up the mountain. Then we all went to Woolrich and did some shopping at the outlet store (I got the shirt I'm wearing right now), I picked up the bike, and went back to the cabin. Dinner and more reading ensued, and some card-playing. Friday we went bike riding again -- seven of us! -- and I went to pick up the laundry in the afternoon. I refueled the Fit, and by golly if I didn't need to hit a men's room just as I was heading by the Old Corner...had a couple pints of Otto's Red Mo with the owner of the Bike Gallery -- a pleasant coincidence, and he told me about the six rattlesnakes his friend had seen along the trail that week! -- then went up the mountain again. 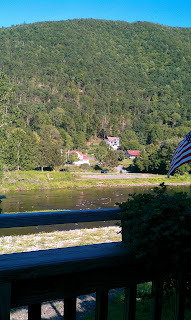 We decided to go out for dinner, and went back up the creek to Hotel Manor -- that's the view from the deck. Dinner was quite nice again -- I had a New Orleans pasta in cream sauce with andouille, shrimp, and chicken -- but the drive back...there was an accident on the road to the cabin, and we sat on the road for an hour and a half. Luckily we were able to keep ourselves amused! The next morning...we'd watched the news, and heard about Irene, and thought about the Corgis -- who were kenneled on the Delaware River -- and decided to cut things short a day and head home. We packed up, said good-bye, and headed southwest. It was uneventful, the dogs were very happy to see us...and Irene left us largely untouched. A good week. "...of a black bear calmly walking up past our cars..."
Isn't the Pine Creek area great? We love the Manor Hotel as well. Nice they have a couple of decent beers. Try the BBQ pork shank next time. And the Cedar Run Inn is an awesome place to eat (and stay). Glad you had a good time! Cedar Run Inn looked interesting; have to check that out next time. Don't be so sure, Mr. Steven. Our reach goes well beyond the lands of sky blue waters and pleasant living. "Our reach goes well beyond the lands of sky blue waters..."
Maybe Theo, but I'm still betting Lew wasn't packing any of Minnesota's finest!